Before Apple unveiled the Apple Watch last September, reports indicated the device would come with 10 sensors to track health and fitness data, leading some healthcare professionals to find the unveiled Apple Watch's health features disappointing. In a new report, The Wall Street Journal offers a look at the original Apple Watch health features that were dropped due to consistency problems. 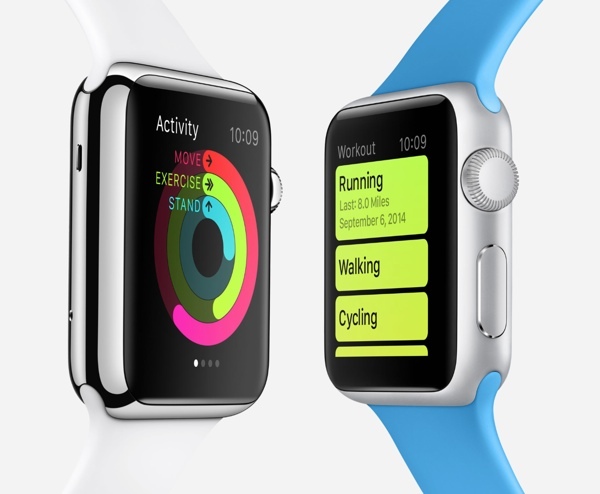 Apple began developing the watch about four years ago, with a focus on health and fitness. It’s not unusual for Apple to experiment with many technologies or shift focus during product development, but the watch was especially challenging, people familiar with the matter said. Internally, the project became known as a “black hole” sucking in resources, one of these people said. The Apple Watch originally featured sensors that measured the conductivity of skin, allowing the device to detect stress levels and heart-rate monitoring similar to an electrocardiogram, also known as an EKG. Apple also experimented with ways to detect blood pressure or how much oxygen is in a user's blood. However, a mix of consistency problems and potential oversight caused Apple to switch the focus of the device from health-related to a more general do-everything product. The skin conductivity features didn't perform well with people who had hairy arms or dry skin, while results varied depending on how tight an Apple Watch was worn on users' wrists. Additionally, if Apple decided to use the health data to provide "health or behavioral advice", the Cupertino company would have to seek approval from the U.S. Food and Drug Administration and other regulators. While these features were dropped for the first version of the Apple Watch, sources tell the WSJ that they could appear in future versions of the device, echoing a Reuters report from September. Last week, Apple CEO Tim Cook said the company's objective with Apple Watch is to "change the way people live their lives" and that people would be surprised by the breadth of what the device can do, which includes activity monitoring, reminding users to stand up after a certain time period, and non-verbal communication with friends. Apple is currently asking developers to have their Apple Watch apps ready by mid-February, with some developers traveling to Apple's Cupertino headquarters for help. Cook has confirmed the Apple Watch will launch in April. The Wall Street Journal reports that Apple will make five to six million units for the first quarter, with half of those units being the entry Apple Watch Sport and one-third being the mid-tier stainless-steel Apple Watch. Apple: "We investigated a whole bunch of wild stuff that isn't ready for mass production and usage yet. Maybe the tech will be more mature in the future and we can include it then." Media: "The watch could've been so much more than the nothing that we currently know about it. We even have an unnamed, un-verified source that made a quip about the scope of the project that we can take out of context to make it sound like there's trouble behind the scenes. Ahh, just imagine the page views." MacRumors Users: "Typical Apple - neutering all of the good features so we have to buy the next generation. Also, just a reminder that some software they released like 6 years ago was buggy. I always have to bring that up in unrelated threads as it is really the only contribution I make to the discussion." Society in two months: "That is amazing! I need one! Going to get it right now!" Media in two months: "Tim Cook's vision is incredible and the watch is amazing. We will mindlessly worship everything about the watch for the next 6 months (or as long as it gets us page views, then we'll go back to attacking)." MacRumors Users in two months: "Well, there are still software bugs in OS X." I've never been huge on the Apple Watch, it has always seemed like Apple is just trying to enter a market because others are doing so. During their demos they touted things like sending emoticons and basic things like a strap to keep the band flush to the wrist. Apple doesn't seem to understand this product themselves, the fact that it is described internally as a black hole is not a good sign. I think this will be apples first major product to be a flop in a long time. Pretty clear to see Apple has big ambitions here. But I'm glad they dropped stuff that wasn't up to snuff rather than just adding sensors for the sake of it whether they were very accurate or not. What a bummer. Health tracking was my #1 reason for getting an Apple Watch. Nice to see a reminder of how everyone claiming the iWatch would measure glucose levels through the skin was wrong. This is basically an overpriced toy. Measuring glucose levels without using blood is something that will be developed by the scientists, not by the designers or toy makers. Pushing the envelope is what great companies do! RELEASING it before it's ready, now, that's what Samsung does!!! Nothing has changed from the announcement in September. What exactly from this story were you expecting to be included the Watch being launched this spring?